As the weather gets colder and the days get darker, our skin can get duller. Our skin becomes dry in the winter because there is less moisture in the air. 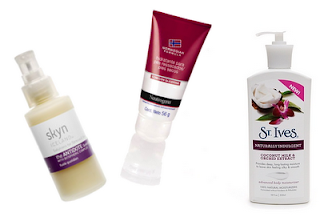 Here are a few products to help you keep the moisture in and help your skin glow. This lotion is an amazing lightweight daily face lotion that hydrates and cools and is perfect for all skin types. It contains Omega 3, 6, and 9 to preserve your skins natural moisture. To cure the dry skin you already have, it has aloe vera, jojoba and shea butter. They put mint in it as well to give your skin a sensational cooling effect, which revitalizes your skin and makes you look refreshed. Always apply lotion after anytime you wash your face. This hand lotion is super portable and cheap, there are over 200 applications in the tube because its super concentrated. Plus, it really works. Hands are the most prone to drying because we constantly wash them. However, if you apply this regularly you wont have to worry. It's the glycerin that instantly relieves chapped skin providing immediate and lasting relief. St. Ives is always a good choice, because they use only natural ingredients and really what else but natural would you want to use? The coconut milk and orchid extract's perfect for dry skin, because it provides a deep and long lasting moisture. It's a non greasy formula but leaves our skin soft. The best part is the coconut milk creates a barrier to help protect your skin from becoming dried out over and over. Here’s a tip: always apply your body lotion right after you get out of a shower. This is when your skin will soak up all the moisture and keep you looking radiant throughout the day.